Decision Science News was back in its former home of Berlin this week. The hotel they put us up in provided free entry to a fancy gym next door. This gym had rowing machines. In the past, we’ve always found it hard to resist trying rowing machines, but always found them too boring to use for long. But this rowing machine, the clever Concept2, had built in games. 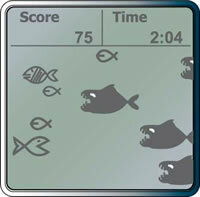 In the fish game, above left, you regulate the speed of your rowing to eat smaller fish and avoid sharks. 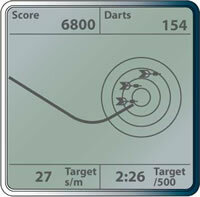 In the dart game, which is better, an even speed of rowing steers virtual darts into a target. Both games provide you a score, which if you are human, you may find hard to resist improving. We figure the games added 20 minutes to our workout. And we’re going back tomorrow and try them again. Call it gamification, incentives for exercise, or whatever; we like the combination of games and exercise machines. Maybe we should just take up a sport? check it out: http://www.fitocracy.com/ another use of gamification to entice exercise. That was less boring was written on July 10, 2012 and filed in Ideas.